Madras is a fine lightweight fabric with a colorful woven pattern. Generally made from cotton, it's used primarily for summer clothing. The fabric takes its eponymous name from its Indian birthplace, Madras, a city established by the British in the 17th century. Located on the Coromandel Coast of the Bay of Bengal in southeast India, Madras was officially renamed to Chennai in 1996, and is the state capital of Tamil Nadu, currently the fifth most populous city in India. You can see how a country in one of the world's hottest climates knows a thing or two about summer dressing. In India, madras is also referred to as "60/40" cloth, representing the thread count: 60 threads running lengthwise (called "warp") and 40 crosswise (called "weft"). This has apparently been determined to be the perfect ratio for optimal lightness and strength, helping the fabric breathe yet remain strong - an ideal fabric for the intense summer heat of India and everywhere else without air conditioning. Madras usually has a solid color background with patterns or designs on them, but the most ubiquitous ones are those that come in plaids. There are many who believe that the madras plaid was influenced by the Scots during their occupation in southern India in the 1800s. They say that the native weavers simply copied, with some modifications, the tartan patterns worn by the Scottish regiments during that time. Whether this was true or not – and I can see the plausibility from a historical context – I do have to admit that there are similarities between the two plaids in both design as well as basic color schemes. Many madrases look like dusty, faded tartans. Traditional madras yarns were dyed with organic vegetable dyes, which was why the colors, although colorful, always had a natural, earthen cast to them. Also, because those veggie dyes were not colorfast (color that won't fade or run when washed, and therefore stable), they naturally "bled" every time the madras was washed, resulting in a newly blended effect each time it was laundered. This style, called "Bleeding Madras" was popular during the 1960s, and that was the true beauty of an authentic madras. Today, most madras are "fast-dyed," meaning they're dyed with stable chemical dyes that don't bleed or fade, allowing you to throw them in the wash with the rest of your colored garments without everything else in the load coming out a little madras-y. And although a "true" madras is 100% hand-loomed from fine yarn-dyed cotton in India and should technically be dyed with these bleeding vegetable dyes, even the hand-loomed ones from India these days are usually dyed colorfast. 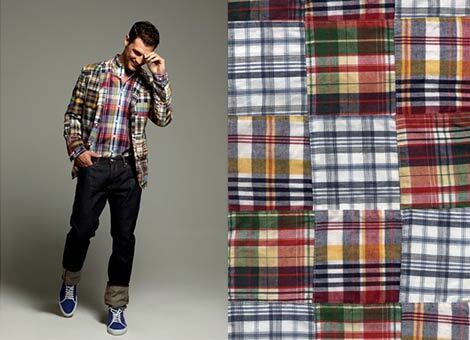 Patchwork madras are also very popular, an invention which also originated from India. Traditionally, it was a creative and economical way to repurpose various madras scraps and ends left over from the cutting floor. They were then cut into small squares and sewn back together to create a single piece of fabric that could be made into garments. Interestingly, the word "patch" also originates from India as an abbreviation of the Telugu word pach’chadamu, meaning "two pieces of cotton cloth joined together." Madras is a definitive summer fabric, as well as a quintessential component of the summer preppy style. You see it made in just about anything – shirts, pants, shorts, jackets, shoes, hats, etc. It's a versatile and unique fabric that should suit almost every man in the heat of summer, prep or not. And if you can't see yourself draped in a yard or two of madras (i.e., shirt, pants or jacket), then try it as an accent piece such as a pocket square, tie or shoe. With madras, a little goes a long way.